We’ve had the good fortune of interviewing some pretty stellar authors and illustrators here on our blog, and have truly loved each and every Q & A session. But today’s interview goes down in history as perhaps one of our favorites of all time. Welcome, Jory John. Jory’s most recent book is Giraffe Problems, illustrated by Lane Smith. It’s about a giraffe named Edward who’s despondent about his long neck until he meets a turtle named Cyrus who’s depressed about the “little excuse for a neck” he’s saddled with. This verbose neckless turtle has had a weeklong banana dilemma that Edward might be able to resolve. And the two just might become the most unlikeliest of friends. Jory will be answering some questions from you all. If there’s anything you ever wanted to ask, leave a question on this Instagram post. One person (and their question) will be picked at random to receive a copy of Giraffe Problems and a board book version of its predecessor, Penguin Problems. Open to US residents and questions can be submitted until the end of day on Wednesday, October 17, 2018.
Who were some of your favorite authors growing up? There were so many! But just off the top of my head, let’s say James Marshall and Judy Blume and Shel Silverstein and Charles Schulz and Beverly Cleary and Gary Larson and Ursula K. Le Guin and―as I was typing this and thinking back and trying to jog my memory―I just remembered that I used to love books by Ruth Chew, who you don’t really hear about too much, these days, as I think a lot of her stuff is out of print. But she wrote tons of stuff involving kids discovering magical powers. I must’ve read at least fifteen of her books. And one more big shout out: I remember being about six years old, and walking around showing Bunnicula by Deborah Howe and James Howe to anybody who would pay attention to me. There was something so funny to me about a vampire rabbit. Actually, come to think of it, there still is. When you were younger, what did you think you were going to be when you grew up? For the longest time, I wanted to be a syndicated newspaper cartoonist with my own daily comic strip. I was heavily inspired by Peanuts, The Far Side, and Calvin and Hobbes, and I genuinely think my childhood coincided with the Golden Age of newspaper comics. To have those three amazingly original comic strips running simultaneously, every single day, was such a gift ... all for the price of a quarter. I’ve never lost my love for comics. In fact, I currently collaborate with my lovely wife, Alyssa, who is a fantastic and hilarious illustrator, on a three-times-per-week webcomic called Animals Got Problems (which you can find on Instagram, dear readers). And I’ve made a bunch of other comics along the way, as well. I love the medium and I still read newspaper comics, webcomics, and graphic novels, any chance I get. Relatedly, I wrote a picture book earlier this year, illustrated by the incredibly talented illustrator and cartoonist Liz Climo, entitled Can Somebody Please Scratch My Back? which was basically written in comic-strip form, entirely in dialogue with word bubbles. That was a blast. I’ve always loved writing. I remember sitting inside on weekends when I was a kid, making up stories, drawing comics, writing scripts, creating little worlds, while other kids were out and about, absorbing sunshine and learning how to pilot a bicycle. I never really thought about the “Why am I doing this?” part too much. I just sort of did it. Writing runs in my family, so that was definitely helpful and inspiring. My grandmother was a print journalist for decades and my great aunt is a wonderful poet (who still sends me original poetry in the mail, to this very day) and my mom produced radio shows … and creativity and writing and books was one of the things that my family really bonded over, over the years. Meanwhile, I've worked with kids in a variety of capacities … as a program director at a nonprofit literacy center, a tutor, a camp counselor, and so on. I was also initially an education major, intending to become a teacher, until I switched to journalism, intending to become a journalist. So yeah, it was really a natural fit for me to combine my love of writing and my love of working with kids into one profession. Voila! How did your time at 826 shape you as a person and writer? If you’re reading this and you’re not familiar with 826 National, you should look it up. Go ahead. I’ll wait. I’m going to go get a snack. I’m back. I got some cheese and crackers, if you’re wondering. In any case, this incredible organization was founded by Dave Eggers and I was the programs director at 826 Valencia, the San Francisco branch, for about six years, coordinating students, volunteers, teachers, parents, student journalists, class field trips, bookmaking sessions, training sessions, book projects, special events, and so forth. I really grew as a leader and a writer and a person in that position and I could do this entire interview about the amazing things that 826 is doing every single day and why you should go get involved. Go ahead. I’ll wait. Also, the folks at 826 were so open-minded and I was allowed to come up with lots of ideas and turn them into book projects and other literary endeavors. For instance, when Barack Obama was first elected president in 2008, I asked Dave if we could create a book of children’s letters to the new president. He immediately said yes, we got kids in all of the chapters across the country writing letters, we compiled and edited and designed a book, and it came out on President Obama’s inauguration day in 2009. The kids’ letters were featured in the “New York Times” and “This American Life” and “People” magazine and they were mentioned on ABC news and there’s an honest-to-goodness photo of President Obama holding their letters. Pretty amazing! That all happened―from concept-to-publication―in six weeks. I think those situations helped me to realize that pretty much anything was possible if you’re starting from a good place, with a good idea, and you’re willing to work hard. Meanwhile, during my tenure at 826, even though I was wildly busy, I’d try to find the time to write something of my own, whether it was a book review, or a humor piece, or a newspaper article, or later, humor books, and then children’s books … and I slowly started piecing together an outside writing life. Eventually, I left to pursue writing, full-time. But I wouldn’t trade that job or those years for anything. What is your writing process like for picture books? Where do your ideas come from? I definitely like to switch things up a bit with my process, so sometimes I’ll write on my computer, sometimes I’ll write longhand in a journal, sometimes I’ll sit at a cafe, or in a park, sometimes I’ll stay at home in my office with my heater running and some music blasting. One thing that I do regularly, though, is something I call “Idea Time.” It goes like this: I get a big stack of blank index cards. I sit for an hour. I write one idea per card. It’s really that simple. Not all the ideas are necessarily book ideas … they can be anything. But after an hour, I’ll put the cards away. Then, a couple of days later, I’ll take them back out and sift through them and look for, say, the three best ideas of the bunch. From there, I’ll try to expand them into drafts. My mind is all over the place, so, along with children’s books, I love to conceptualize other projects, like humor books or games or a book of postcards I just made with my wife, called, “I Miss You Barack Obama, which was published a couple months ago. To try to answer your question about where my ideas come from, I think the very first step (and I’m surely not the first to say this) is finding a comfortable place to sit, taking out a pen and some paper, and just going for it. Start writing things down. Don’t wait for inspiration. Write down a potential title, write down a character’s name, write a first sentence, think about somebody whose life you’d like to explore, see what direction that takes you. Make lists. Make bubble graphs. Draw somebody, give them a word bubble, and figure out what they’d say. Try morning pages, where you just write for twenty-five minutes without editing or stopping. Start a journal. Just get something down on paper. That’s where ideas come from. If you’re just walking around, waiting for that perfect idea to strike, you might be walking around and waiting for quite a while. Treat this like a job, with concrete hours, and really just sit there and make it happen. And don’t give up when you have tough writing days. We all have those. What inspired Penguin Problems and its companion book Giraffe Problems? I suppose I have a tendency to get caught up in some of the smaller details of life. I catch myself complaining about little things. I’m not proud of it, but I’ll own it, here and now. In any case, I had a realization that we all do this, to some extent, when we’re tired or annoyed or there are just too many things coming at us on any given day. It’s hard to always think “big picture” and write in your gratitude journal when you’re caught up in the little details and annoyed at a motorcycle driving by, or whatever. So that got me thinking about what animals would sound like if they were walking around, muttering stuff about their daily annoyances. On top of that, I have a love of penguins (who doesn’t?) and thought that a.) they would be really funny creatures to feature and that b.) a story about a penguin in the middle of an icy landscape would provide plenty of space for an artist to explore. I should say that I never dreamed that artist would be the legendary Lane Smith. Boy oh boy, did that work out quite nicely! With Giraffe Problems, we wanted to continue our look at animals complaining about stuff. I had an idea about a giraffe who feels bad about his neck and I wrote something I was really happy with. And it went from there. We also wanted to switch up the location and the look and the color palette and add in a few more surprises. I am so incredibly proud of both of those books and I’m so happy that they’re finally out in the world. Working with Lane has been an incredible experience. He is so talented and kind and humble. What are some of your biggest challenges in writing? Distractions! I miss the days of basic typewriters, where all you had were ideas, paper, and keys with various letters on them, which you could use to form words and then, later, sentences. Actually, I still own a typewriter and I should get back to using it. As the old saying goes, “There’s less of a chance of repeatedly checking Facebook on your old-fashioned typewriter that doesn’t have an internet connection.” Also, because the process of writing these books takes at least two years from idea to publication―and sometimes much longer―you have to learn to be very patient. Something I might finish this afternoon in October, 2018, would probably come out in late 2020 at the very earliest. I’m a person whose legs literally bounce up and down while I’m sitting somewhere, so patience isn’t my all-time best virtue. But I’m getting better at it. It’s all sort of like time travel, in a weird way. Like, Giraffe Problems has finally caught up with me, and I wrote it in 2016. Lastly, everybody gets discouraged from time-to-time. It’s all about being flexible, being willing to move on to other projects, and being willing to toss stuff out that’s not working, or come back to it later, with fresh eyes. I make a to-do list every single day, without fail, and there are at least three things on it that must get finished by the time my day is over. Sometimes, my must-finish items are book projects. Or they’re promotional things. Or they’re school visits. Or they’re unrelated to writing. But a list plays a huge part of my day. I highly recommend daily lists and would be personally lost without them. I have a whole list process that I won’t bore you (or me) with. Usually, included in my daily activities, I have some sort of brainstorming session, as discussed in your question above about ideas. Then I’ll work on whatever I happen to be working on. After I finish answering these questions, for instance, I’m going to get back to something that’s about half finished and due relatively soon. For me, mornings and early afternoons are for writing. The rest of the day is for all the other stuff, errands and bills and phone calls and emails and so forth. But I really think it’s important to get up, get some coffee, get writing and see what happens. What’s the funniest or most unexpected thing a kid has ever told you about one of your books? There have been so many great kid moments along the way and I really should’ve been keeping a journal of all of them, just in case this question ever came up! Here are some random memories, again off the top of my head: I remember when my picture book with Pete Oswald―The Bad Seed―came out, a little boy came to the my event dressed as the title character, The Bad Seed. So cool. I also remember a kid writing a great rock song about Floyd Peterson, the title character, from my book with Bob Shea, Quit Calling Me a Monster! It was mostly him screaming “Floyd Peterson!! !” over and over again while thrashing at a guitar. He must’ve been five at the time. There was a kid at a school visit who politely raised her hand and told me that her parents said that she’s Duck, from the Goodnight Already! series. So many more things have happened. I’ll try to remember them for our next interview. And last question. Cake or pie? Here’s something potentially alarming: I don’t really have much of a sweet tooth. True story: I would gladly choose a jar of pickles or green olives or chips and salsa over most sweet things, possibly with the notable exception of ice cream, or the song “Sweet Thing” by Van Morrison. But I want to answer your question honestly, and I know it’s an important one, so I’ll go ahead and say pie, and, more specifically―especially since it’s the season and it’s also my favorite type of pie―pumpkin. Oh boy, do I love pumpkin pie. So the answer is pickles, then pie, then cake. To check out more of Jory’s work, visit his website or catch him at the Portland Book Festival in November. Thanks for stopping by, Jory! First it was the hills just north of San Francisco. About ten years ago, walking there with my then-infant daughter, it struck me that the hills could be hollow, and there could be worlds inside. That was the initial impetus. After that, every year or so some new layer would arrive and add itself to the story — an imploding society, a strong young leader named Catalina Catalan, a hero-in-waiting named Granite Flowerpetal. What is your hope for the story? What do you want kids to see, think about or come away with after reading it? I hope they see themselves as able to do heroic things. Far too much time spent sitting, writing in a yellow chair in my garage. What are some of your favorite children’s books, past and present? All of Sendak of course. Dahlov Ipcar’s The Cat at Night. Blueberries for Sal. Mr. Popper’s Penguins. In terms of new books, I love Mac Barnett’s work, and Jory John’s, and Aaron Renier’s. And Kate DiCamillo, I think, is a towering master of the chapter book for young people. What do you see as some of the best ways to foster creativity in children? It’s not so hard. Give them time and encouragement. I guess that’s not so easy always. But the time has to come first. Quiet, uninterrupted time to think, write, create, be ludicrous. Then, once they create something ludicrous — because very often it is — that weirdness has to be validated, not squashed. There’s no easier way to discourage a young creative person by telling them, the first time they create, that what they’ve created is not appropriate in some way. It’s all appropriate. We have to let kids, who are all inherently weird, express that weirdness. What are some of your most memorable experiences working with children at 826 Valencia? They’re all memorable. Honestly, every single one. A few weeks ago I met a young girl, who was 7, and she was tasked with writing a poem about herself and then recording it in one of our podcast studios. She was so shy at the start! There was another student, much less shy, at the table, and she and I encouraged her for an hour as she wrote, revised, and practiced, and by the time she recorded her work, she was so confident she was bursting. It just doesn’t take that much in many cases to bring out someone’s voice. When you think about all of the young people who have walked through the doors of 826 Valencia, what have been some of their greatest needs? Obviously the English-language learners have high needs. If they’re just learning the language and are mainstreamed in their school, it can be like being dumped in the middle of the ocean and made to swim. But they can get there, honestly in a few years of dedicated work and one-on-one attention. I just talked to a young woman who arrived from Guatemala three years ago, at age 14, with no English whatsoever. She learned, thrived, and is on her way to UC Berkeley. We gave her a scholarship to help her with expenses and such, but she’s a force to be reckoned with already. Very often we’re just clearing the path a bit for young people on their way. When mentoring young people today, what are the best ways we can invest in their lives? Give support, time and money to organizations that provide one-on-one attention to students, and which make teachers’ lives a bit easier. What are five books you feel every person should read before they graduate high school? I’ll name five here, but I think there are probably 50 that I would recommend, with that list being curated a bit for any given student: Leaves of Grass by Walt Whitman; Invisible Man by Ralph Ellison; Half of a Yellow Sun by Chimamanda Ngozi Adichie; Oh Pioneers! by Willa Cather, and The House of Broken Angels by Luis Alberto Urrea. The books that meant the most to me in high school, in large part because my teachers taught them so well, were Catch-22, Macbeth, and Huckleberry Finn, so I’d add those, too. What advice would you give to writers looking to get their work published? There has never been a better time to be an aspiring writer. There are more print journals, more online magazines, more forums in general, for writers, than at any time in history. But when you submit your work, be mindful that there are humans on the other end of the process. Too often, at McSweeney’s, people who submit to us think of the (very few—four, in fact) staffers at McSweeney’s as a kind of reading-and-publishing service they’re entitled to, as opposed to a small group of hardworking people who love books. So when you send your work out, be kind, be patient and be human. We absolutely loved This Bridge Will Not Be Gray, Her Right Foot and we’re looking forward to the publication of What Can a Citizen Do? Will we see any more middle grade or picture books from you in the near future? There are some more in the pipeline, for sure. After Citizen, Shawn Harris and I are working on the story of how a city grows from a trading post in the wilderness to a modern metropolis. It’s something I’ve been a bit obsessed with for years—a time-lapse look at where societies come from. Many thanks to Dave for such thoughtful answers and for sharing about his work. Read more on his site about his initiatives, projects and body of work as a writer, journalist, artist, philanthropist, editor and founder of McSweeney’s. What will today bring? In her latest book TODAY, in her natural and effortless way, Julie Morstad shows us the beauty of the quotidian, its moments of whimsy and its potential to surprise us with something extraordinary. But how? She helps us revel in the possibilities of today. What should we wear? What should we eat for breakfast? Porridge or pizza? Where should we go? For a walk in the woods or to the museum? How will we get there? By bike or dancing our way there? She reminds us that each day is remarkable in its own right. Julie's work resonates with children and adults alike. Hers are the stories full of wonder that you read to your kids at bedtime and are the same ones that you want to sit down with on your own and linger over, during those last quiet moments of the long day, well after your kids have drifted off to sleep. Julie graciously stopped by to chat for a bit and answer five questions for us. How do you come up with ideas for the books that you author and illustrate? A lot of ideas come from my kids and the other kids I know. The way they see things. I also get inspired by everyday things like leaves on the ground, or the moon … random thoughts, art and textiles. Which illustrators or artists have most influenced your work? How can i choose? Hmm....Alice and Martin Provensen, Gyo Fujikawa, Kenojuak Ashevak, Maurice Sendak, Remy Charlip, Roger Duvoisin, Miroslav Sasek, Ingrid Vang Nyman, Tove Jansson, Evaline Ness, Sonia Delaunay, Saul Steinberg, Paul Klee, Tomi Ungerer, my kids’ drawings. What drew you to illustrating picture books? I have alway loved picture books as a medium. I had a son quite young and we spent a lot of time at the library. I learned a lot about illustrators by hunting through the library sale tables…treasure!! 2. Get down to work! I work from home so I have to try hard to stay focused in my house! Any new projects that you're working on that you can tell us about? I’m working on a new book with Kyo Maclear (we made Julia, Child together). It's a picture book bio about Elsa Schiaparelli, the great 20th century fashion designer. It's super fun. Thank you, Julie, for stopping by! You can see Julie’s beautiful work on her site and keep up with her latest on Instagram. Vikki VanSickle stops by today to answer five questions about the writing process for If I Had a Gryphon, what brought her to children’s publishing and more. If I Had a Gryphon was published earlier this year and was illustrated by Cale Atkinson. What was the writing process like for If I Had a Gryphon and how long did it take from idea to publication? The spark came while I was working at The Flying Dragon Bookshop in Toronto in 2009. I sat in on a lot of storytimes and fell (more) in love with picture books. I really wanted to write one, but I was a bit stuck when it came to ideas. I had written a few middle grade novels, but picture books were new and daunting. At the time, Harry Potter was king and I noticed a lot of younger children wanted storybooks that were Harry Potter-esque, but most of what I could find (Dragonology, Mythology, How to Train Your Dragon) were for older readers or only featured the standard beasts (dragons, unicorns, monsters). 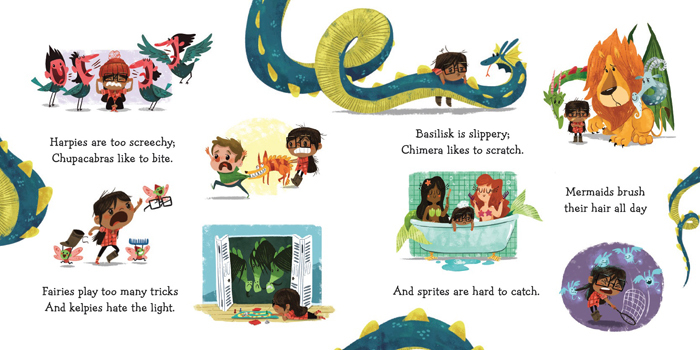 These things were all percolating in my head and I decided to write an introduction to magical and mythological creatures for the very young. The first draft was essentially a list poem, with a little girl listing magical pet options and how she would look after them in order to convince her father. It was very sweet and fun to write, but it didn't have a great sense of urgency. As I thought about it I realized how challenging it would be to look after some of the creatures. With some advice from a dear writing friend and my agent, I re-ordered the list from low-maintenance to high maintenance to increase the tension from a content perspective. In terms of structure, I re-wrote it so the dedicated-creature stanzas got shorter and shorter until the last section, in which there's a new creature every line. This crescendos nicely and gives a sense of chaos. The book is a more fun and has a lot more drive now. A number of publishers considered the manuscript, but it wasn't contracted until 2013. Some editors liked the story, but did not like the rhyme. I tried to rewrite it in prose but it didn't feel right to me, it lost some of its magic. Tundra Books had no problem with the rhyme, which was as sign that Gryphon had found the right home. I was thrilled when Cale Atkinson agreed to illustrate. Some of the creatures are historically quite scary, but in his capable hands they were fun, gregarious, and downright cuddly! It is such a privilege to have an artist interpret your words and I could not be more thrilled with the final product. What brought you to the world of children’s publishing? Reading has been the most transformative force in my life. Working in children's publishing, I get to be part of creating the books that will have an impact on another generation. 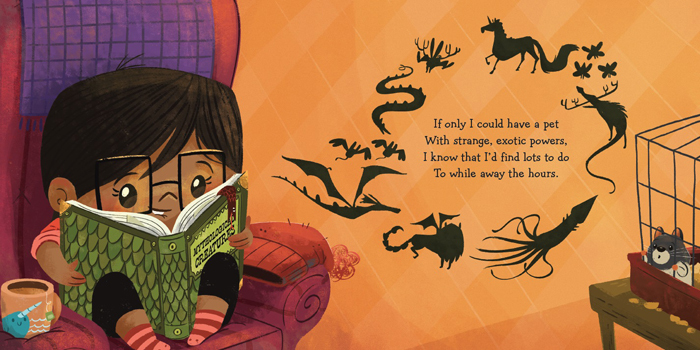 I've been lucky enough to try many avenues in the wonderful world of children's books. I've worked in a public library as the children's summer programmer, managed an independent children's book store, reviewed kids' books for Canadian literary periodicals, and eventually landed in publishing, all the while writing up a storm. I have loved all of these jobs and have learned valuable things in each one. What kinds of books were you drawn to as a child? I read anything and everything, but I especially liked books featuring cats. A Rose for Pinkerton and Catwings were two favourites. We also had an anthology of poetry that I read over and over again. I loved how a single poem on a single page could contain a whole world. I was mystified that so few words could inspire such big, expansive images in my head. Eventually I became a total mystery nut. I blame it on the fantastic Miss Nelson is Missing, which was the first mystery story I ever read. As I got older I graduated to Nancy Drew. I still love a good mystery! What other career avenues do you think you would have pursued if you didn’t work in publishing? I had intended to be a playwright before I got (happily) sidetracked by children's literature. I also considered teaching or librarianship, as they combined working with books and children, two of my favourite things. Lately I've been fascinated by political speechwriting. I love how mere words can shape ideas and create change. I think it's safe to say that whatever industry I ended up in, there was bound to be a book or writing-related component! We loved chatting with you, Vikki, and many thanks for stopping by. Be sure to check out Vikki’s blog and keep up with her latest on Instagram and Twitter. Author Andrea Beaty stops by to answer five questions about her literary brood of wunderkinds, how she became a writer and more. 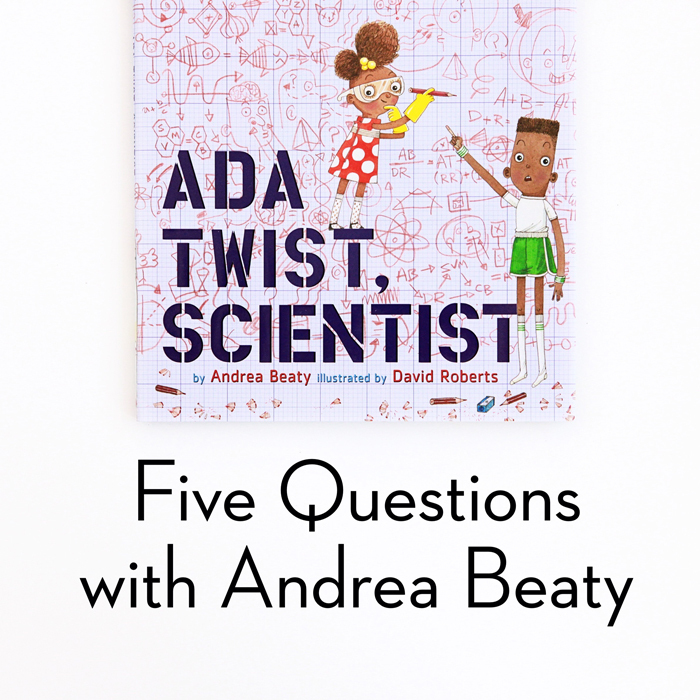 Her newest collaboration with illustrator David Roberts, ADA TWIST, SCIENTIST, is out now. How and why did you decide to become a writer? While I've always loved books and writing, I never thought about writing professionally until I was about 30. I studied biology and computer science in college and worked for a few years in the software industry. Once I had kids and got to read books with them, I started getting ideas for stories, wrote them and (20 years later) here I am! Life is always an unexpected journey! What inspired the stories of Iggy, Rosie and now brilliant little Ada? Iggy was inspired by my son who loved building things when he was a little kid. Rosie and Ada grew out of David Roberts' amazing illustrations. I spent a lot of time staring at his art to find clues about the kids' personalities. Rosie hides behind her bangs so i asked "Why?" and the story grew from there. Ada is the girl standing to one side and thinking while the other kids are gathering shoestrings to build Iggy's bridge. GO DOG, GO! and HOW THE GRINCH STOLE CHRISTMAS were my favorite picture books. For novels, Nancy Drew and Trixie Belden were my faves. I think there are some great books from my childhood which still survive today, but by and large, the quality of picture books now is so much better than when I was growing up. Typically how long is the writing process for one of your books from idea to publication? The answer to that question is "I have no clue!" It varies so much from book to book. I've written books in an hour (DOCTOR TED) and taken 10 years to write others (HUSH BABY GHOSTLING). My first picture book took 5 years to reach readers AFTER I sold it. Others have been published in 18 months. What have been some of your biggest challenges in the writing process, for any of your books? Always, my biggest challenge is carving out time to write. I tend to let other things grab my attention and then I get off track. It's a good problem to have, but one I need to work on. Thank you, Andrea, for stopping by to chat with us. You can read about Andrea’s work on her site and keep up with her latest news on Twitter. Images courtesy of Andrea Beaty, David Roberts and Abrams Books.